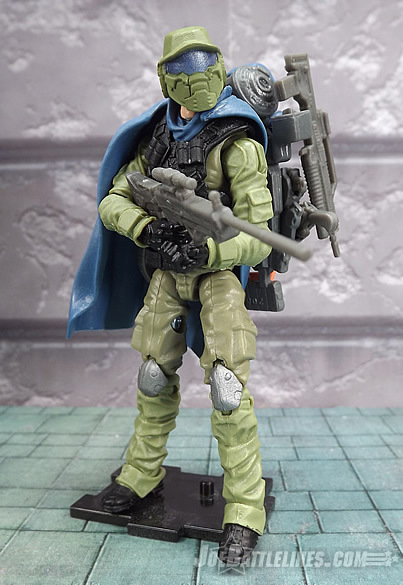 It’s confession time—I love Cobra Troopers. Blue shirts, Vipers, Crimson Guardsmen, Frag Vipers, Alley Vipers, Canon Fodder Vipers—all of them are like candy to this particular Joe fan. So much so that I hesitate to think of the amount of money I’ve spent in the past decade troop-building figures. However, I could always justify the purchases by saying that “Cobra was an army! 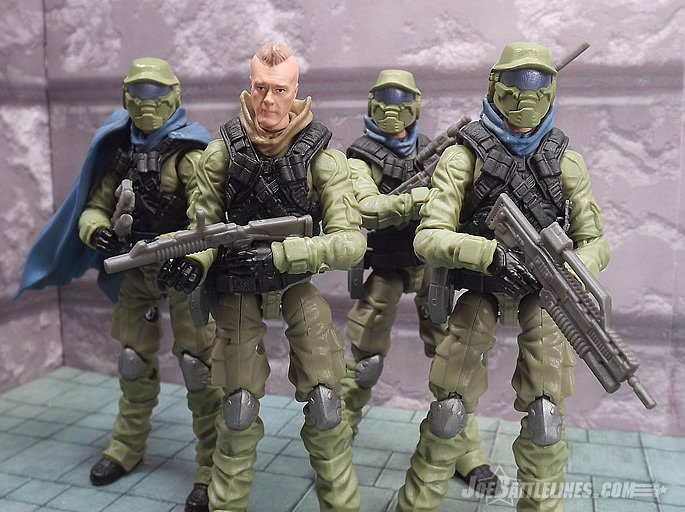 There should be more than one of each trooper!” The same never held true for the Joe team which was comprised of various specialists from the five armed services. Oh sure, fellow collectors will point out that G.I. Joe had the green shirts in the Sunbow series and the Steel Brigade but neither of these ever made a real impression. 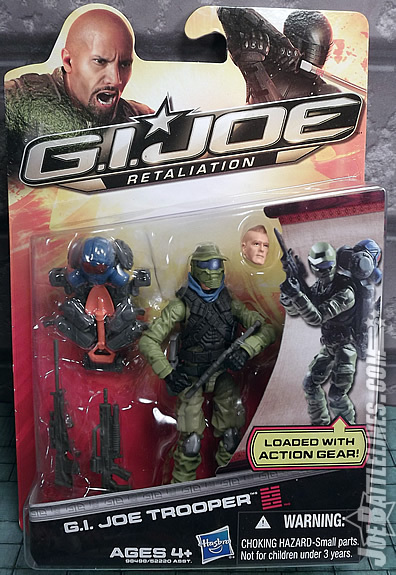 However, all of that changed when I got my hands on the Retaliation G.I. Joe Trooper. 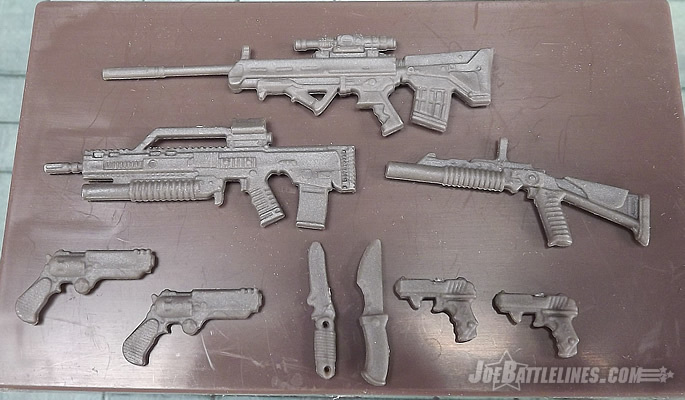 Suddenly, the concept of a Joe troop-builder made a weird sort of sense. At first glance this figure seems to be a weird amalgamation of styles and genres. The basic body is a plain military-esque set of coveralls with sculpted wrist pouches and kneepads. Highly detailed, the mold features more fabric wrinkles than the back half of my laundry pile which perfectly simulates the appearance of fabric. 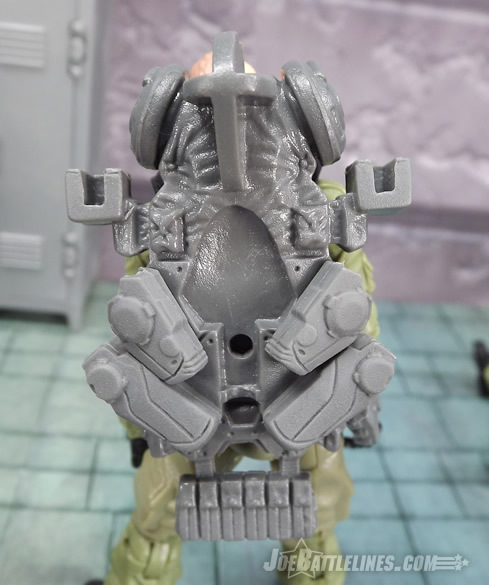 Over the top of the torso is a black tac-vest that features a variety of sculpted pouches and even what appear to be several grenades. The result is a mix of what appears to be an airman’s uniform with a heavy dash of Ghost Recon or Call of Duty: Modern Warfare. (Or a fairly uncanny version of the season 1 – 5 uniforms from Stargate SG-1.) The look is decidedly military but with a heavy dash of “modern” thrown in for flavor. However, the combination works in a way that the Steel Brigade with its odd color scheme never did for me. 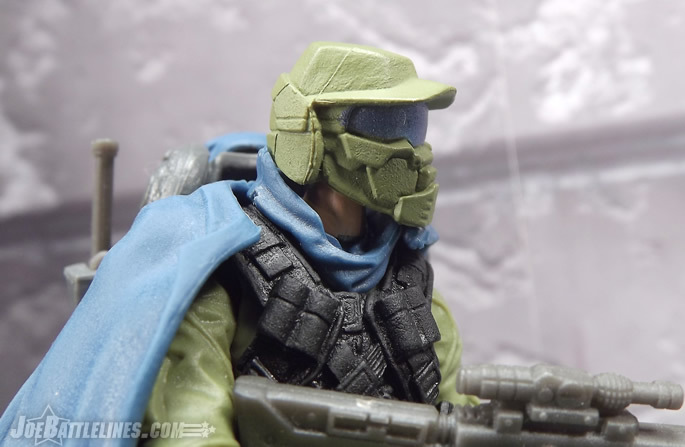 Add in the high colored neck scarf (in either blue or tan) and you’ve got a very solid base for a modern spec-ops trooper or even “future warrior.” (More on this later.) 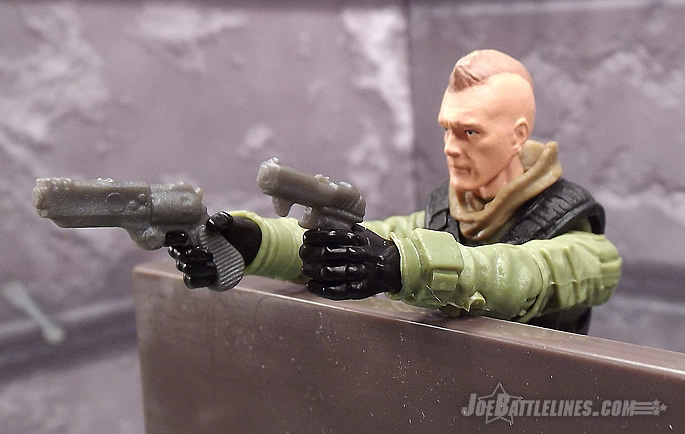 The articulation is what you’ve come to expect from the Joe line with the addition of hinged wrists which only make posing him that much more fun. Overall, the body design is pure “win” in my opinion. 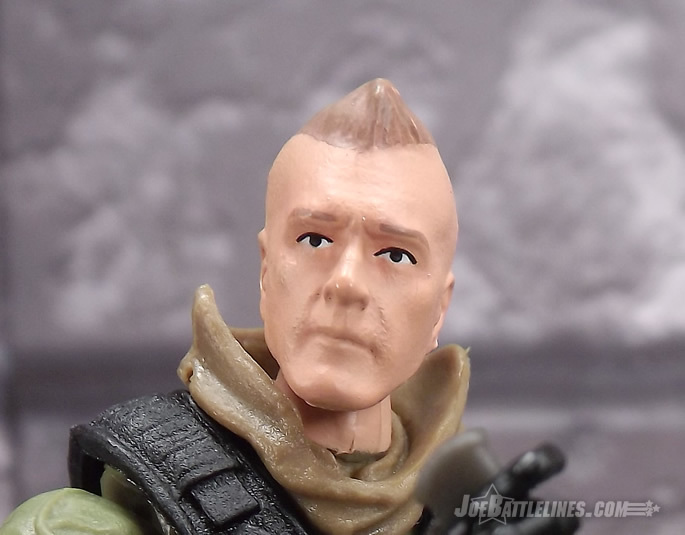 For those fans who might not want to troop build these figures and instead are looking for a figure with more personality, the crew in Pawtucket has also included an unmasked head. What’s interesting about this head is that I’m left with three distinct impressions as to who it might be based on. The first is the most obvious—John “Soap” MacTavish of the Call of Duty: Modern Warfare franchise. 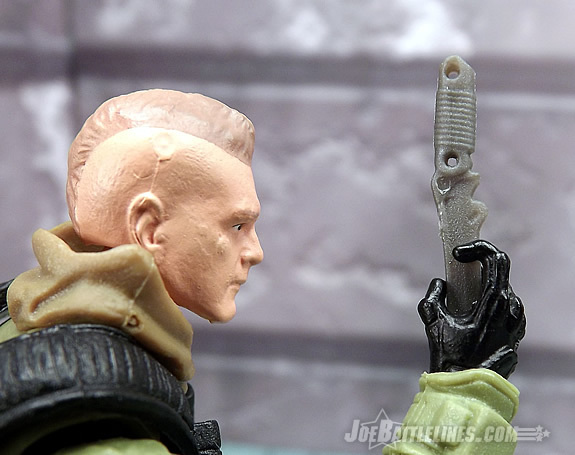 While the sculpt does seem to be a bit older than Soap is typically portrayed, the likeness is pretty strong and not just due to the Mohawk. The second option (and this is a favorite of mine) is Mattias Nilsson of Pandemic Studios awesome “Mercenaries” franchise. It’s not a perfect likeness as he’s missing the sunglasses and the facial hair but the look is definitely there. The third is probably based more on my recent marathon of the CBS series “The Unit” than anything else but the set of the eyes and the jaw line conjure images of actor Robert Patrick who portrayed the Delta Force Colonel Thomas Ryan. My own predispositions aside, the head sculpt is fantastic—hard-edged, serious, and firm. There’s a lot of character in this secondary head which is why it is being used as my unit commander for the G.I. Joe Troopers. When it comes to gear, Hasbro continues the trend of “not skimping”. The trooper comes equipped with more weapons than the entire Belgian army: two knives, two large pistols, two smaller pistols, an assault rifle, a scoped rifle, and a grenade launcher. Oh yeah, and a shovel and a gas mask. Did I forget to mention the backpack that holds all of this? 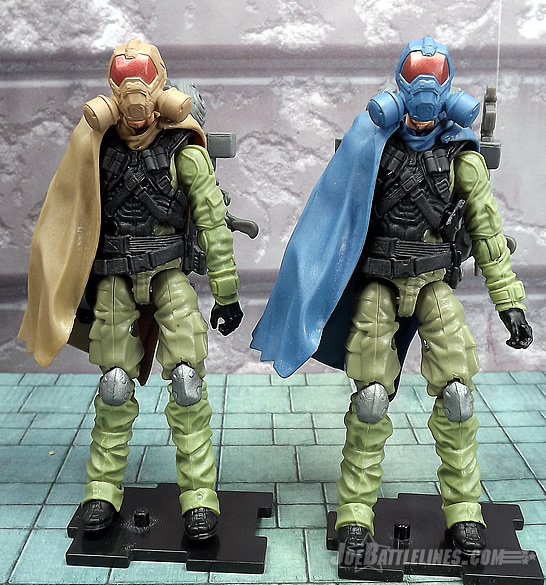 Also, he’s got a “survival cloak.” Seriously—it’s as if someone at Hasbro just decided to see how much gear could be included with one figure before a bean-counter’s head exploded. (I’m looking at you, John Warden!) It’s a fantastic assortment of equipment that allows a tremendous amount of versatility in both play and display. Want to take on Zombie Vipers? Toss on the gas mask! 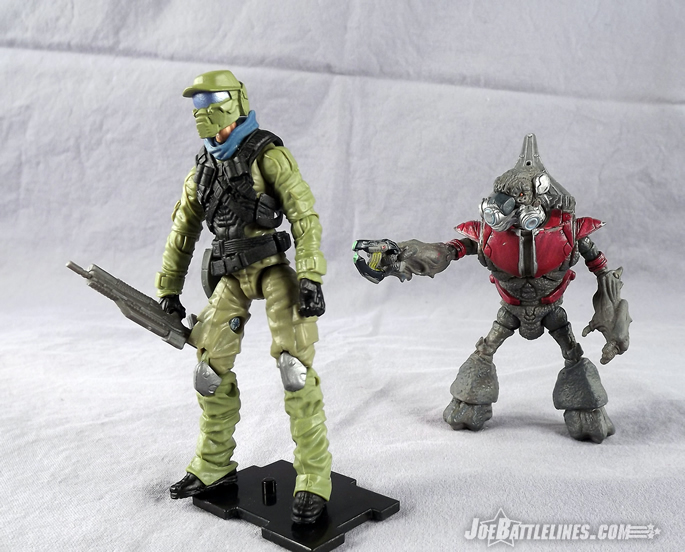 Want to pretend these are HALO figures? Use the assault rifle and the pseudo battle rifle! Need to dig some trenches? 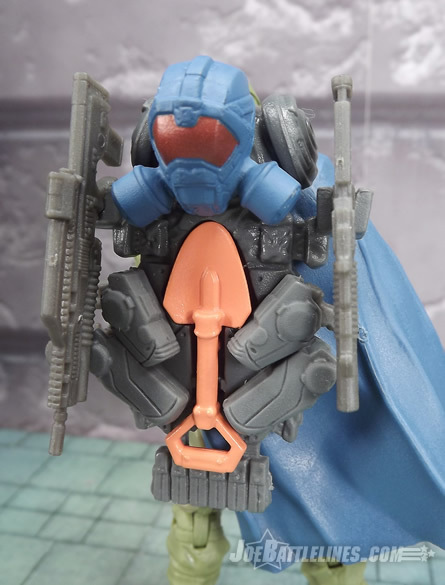 There’s an orange shovel for that! 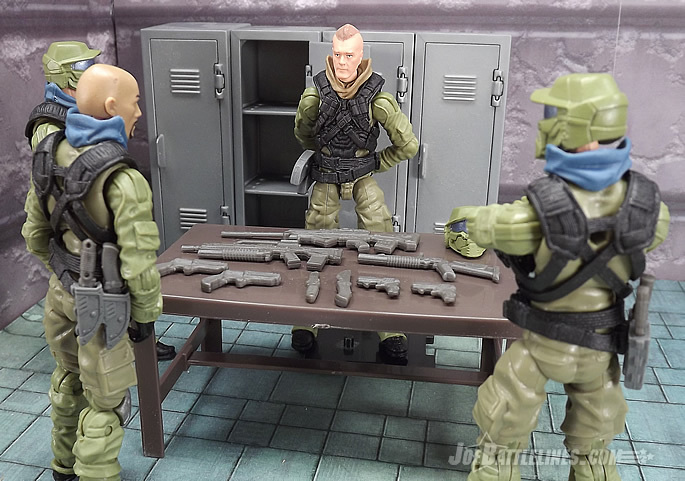 The result is a figure that is essentially the “Swiss Army Knife” of 1:18 action figures—equipped for nearly anything and able to store ALL of his gear on his person! (Save for the extra unused head but I’ll give that to Hasbro.) He’s a terrific value for the price! If the Retaliation G.I. 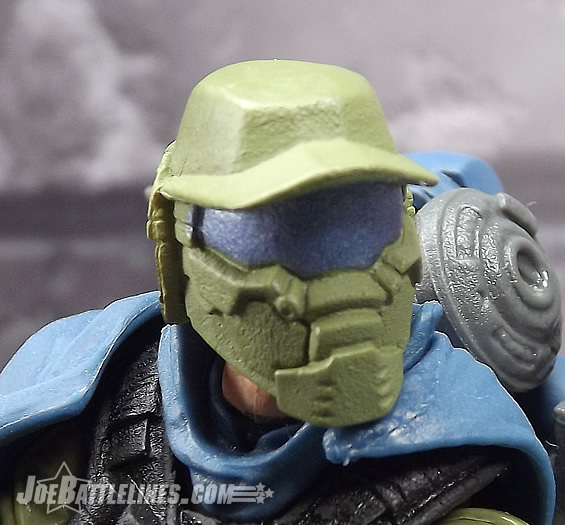 Joe Trooper has a downside it’s found in the quality of the plastic used in his construction. 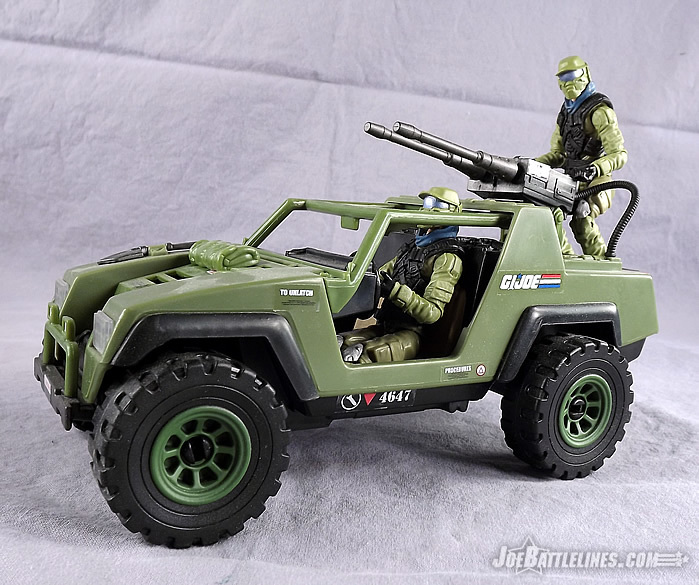 With the movie line and the ever-increasing cost of producing toys, Hasbro opted to cut costs by using a softer plastic than was found on even the 25A line. The result is a figure that has incredible sculpting detail but very soft limbs. While shooting the review I had to take the figures out from under the heat of the lights every so often or they’d have trouble standing. 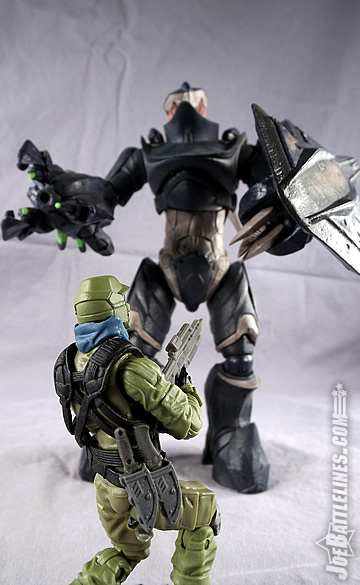 (No stands are included but I’m using the IDS stands from Marauder Gun-Runners!) There’s not a lot that can be done about the softer plastic but it is worth mentioning here. So, what’s the bottom line? Simply put—this is THE best Joe troop builder produced to date. The G.I. 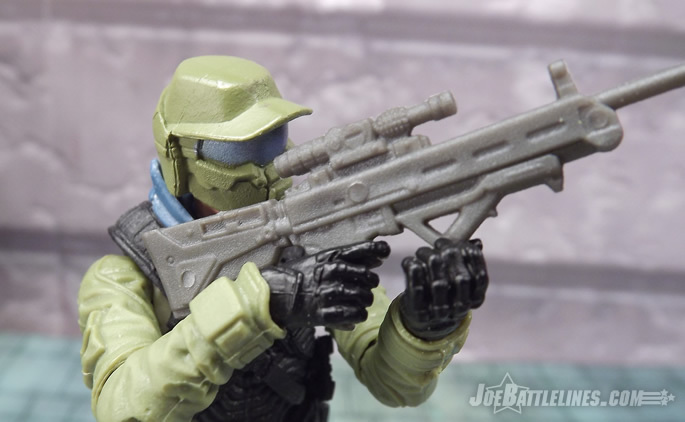 Joe Trooper has a fantastic sculpt, a military color scheme, a strong HALO/ Ghost Recon aesthetic, and more weapons than you can lose in an afternoon at the park. While I find the backpack and the survival cloak to almost be “too much” gear, they still work great for a display perspective. The plastic may be softer than fans are used to in recent waves but the figure itself utterly fails to disappoint on any level. 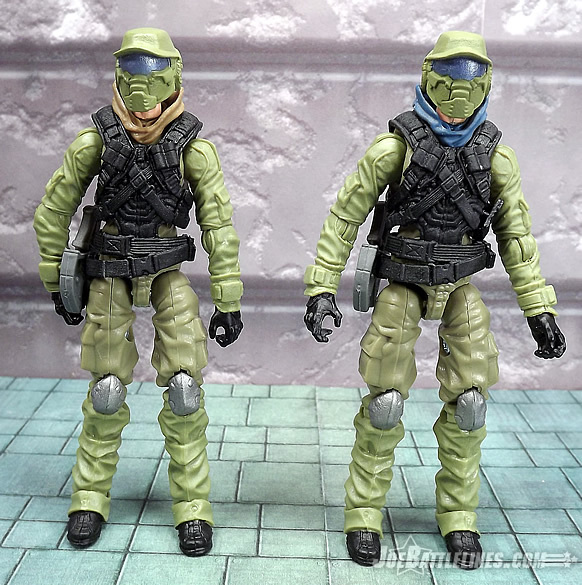 With two color variations due to hit stores again in February 2013 it’s easy to see fans troop building two squads of this trooper: tan and blue. However, for now my tan trooper will remain the squad leader… until I can snag more! 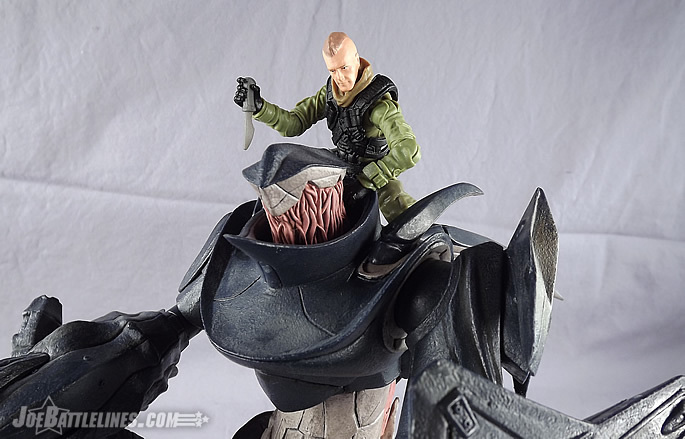 Seriously- this figure is a MUST buy!